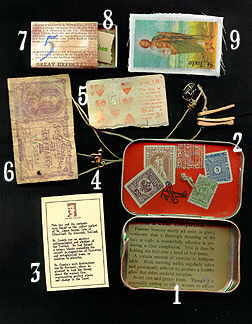 This is an Altoid tin shrine created for a 2000 Capolan exchange, and titled the Relic Room Assemblage. Altoid tin, secured with an antique button, and hemp twine with beads. First, I hammered it to age it. Then I sprayed it with a cream-colored epoxy paint, intended for use on large appliances. Finally, I sprayed the tin with copper and gold spray paints, to create a spattered effect. The closure: I hammered two holes in the cover with an awl, and tied an antique button to the top. The button is used to hold the tin closed. The tin is secured with hemp twine, on which I strung wooden beads, glass beads, and a semi-precious stone. 1. On the bottom inside of the tin, I glued text from an old snake oil (patent medicine) magazine. 2. Inside the lid, I glued red paper, plus (real) antique stamps. I rubber stamped it, too. The hemp twine which secures the antique button on top, is tied inside the tin, so the knot shows here. 3. A card describing the owner of the tin, with his photo. The 19th-century photo actually shows one of my Irish ancestors, James “Jamie” Cronin. This box and its contents were found in the jacket pocket of Dr. James Cronin, late of Kilmallock, Co. Limerick, Ireland. Dr. Cronin was an amateur anthropologist and student of the Tuathai. He had formed a unique thesis regarding the juxtaposition of Christian and metaphysical icons, in relation to miracles. Dr. Cronin’s next destination was Hy-Breasail, where he planned to test his theory about the number five representing perfect stasis and change in the Tarot. 4. Each box contains a small brass monkey. It’s a reference to the golden era of “adventure” fiction, including Arthur Conan Doyle, Edgar Rice Burroughs, and so on. 5. Part of a playing card from a fortune-telling deck. It’s aged (sandpaper and folding), smudged with gold leaf, and punched with the number 5, using an antique check-writing punch. 6. Each box has at least one actual bit of currency from an exotic country. 7. Matchbox, covered with reproduction newspaper from Harper’s Weekly during the Civil War. It’s stamped with the number 5 from a clock stamp set. I aged the paper with coffee. 8. Each box has a slightly different content, but each one contains an antique strip of paper on which I stamped “I will grant you three wishes.” The boxes also contain fetish items, including (sometimes) an animal figurine of wood or quartz, and/or a small golden ring. 9. On fabric, I transferred the image of St. Jude, patron saint of lost causes. The miracles of St. Jude are tremendous. On the reverse side, I transferred a cryptic mix of images, including a dark photo of Disney’s Haunted Mansion being struck by lightning, plus a scan of a Tarot card, The Tower, from a deck called The Vision Tarot. Hello….why am I unable to see the images of your art works? (I have the magic ability to make things disappear on computers, according to my ex-husband.) Thanks in advance. I have loved your site for a while!